Welcome to Sydney’s newest suburb and welcome to your Barangaroo locksmith. Right in the heart of Sydney’s CBD, Barangaroo boasts an attractive location for businesses and restaurants. All of Barangaroo’s residents and businesses deserve the best, matching your wonderful access to the city and water views. You too deserve the best locksmith services with Fusion Locksmiths. All our licensed, insured and fully trained team of locksmiths can help you with any locksmith need you may have – whether it is electronic security, keyless entry, safe installation or you have locked yourself out of your home, business or car! Our training means we follow the locksmith industry standards and the Building Code of Australia guidelines. Need an Emergency Lock-Out Service? Our emergency locksmith service can be at your door within the hour, most of the times even quicker. As a local family-run business, our locksmiths are waiting 24 hours, 7 days a week to help you get back inside, feeling safe and secure. It doesn’t matter what time of the day or night or how it happened – we can help! Has Your Barangaroo Property Been Broken Into? That’s part of our locksmith service as well. We not only fix your broken lock, we also can secure your doors, windows or any other property that has been damaged in the break-in, so it doesn’t happen again! 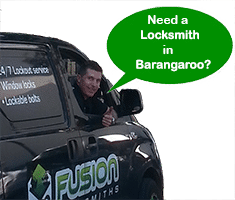 Call Fusion Locksmiths now, for expert and experienced locksmith service!